Gurgaon, Oct 15, 2014: It was yet another battle of the corporates, albeit with a difference! The game of one-upmanship, this time, was held at a cricket field as employees of Sun Life Asia Service Centre India played their heart out against their counterparts at Google. 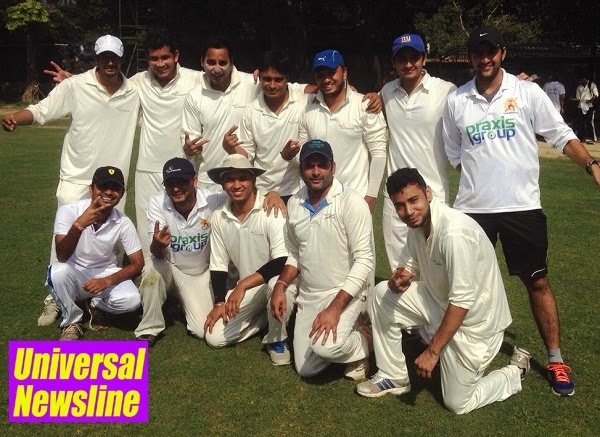 In a friendly corporate tie played at the St. Stephen’s Ground, New Delhi, the two teams played a 20 over match, with ASCI emerging victorious in the battle. However, it was the spirit of friendship that won the day. Google won the toss and chose to bat on the bright sunny Saturday, and got off to a good start. The batting, however, slowed down after the team lost its swash buckling opener. Scoring steadily at 5 runs an over, the Google India team clogged on 106 runs in 20 overs, setting the field for ASCI’s run chase. SunLife ASCI’s run chase started on a negative note, with the team losing its first wicket early on in the innings. The top and middle order of the team struggled a bit, but steadied the innings effectively, laying ground for an easy chase. Varun Mittal (50 not out) was the top scorer of the match, while Kishore Singh (37), gave him good support at the crease. In the end, the Asia Service Centre India team won the match easily in just 13 overs, with 4 wickets still in hand. “Sport is a wonderful teacher. It teaches the players the need for hard work, planning, strategy and execution. It teaches us that to win or lose is a part of life but delivering to your potential and giving your best is what really matters. Above all, such sporting events give our employees the much-needed opportunity to recharge and face the daily work life pressures with fortitude. Developing the sporting spirit helps develop winners,” says Mr. Rajeev Bhardwaj, Vice President-Human Resource at Sun Life Financial’s Asia Service Centre in Gurgaon.